“Henna” is the Persian name for a flowering shrub (Lawsonia inermis) originally found along the Mediterranean coasts. The plant grows 8-10 feet high and is also a commercial crop in arid regions of Pakistan, Southern India, Egypt, Morocco, Yemen, and Iran. In the U.S. it is commonly known as the Egyptian privet or the mignonette tree and is grown as an ornamental in the subtropical regions, such as Florida. The flower of the henna plant is small, pink or white and sweet smelling, but it is the leaves that have the staining capability. Hotter and drier climates have higher levels of tannins that produce the deep, rich color. Therefore, henna grown in the U.S does not produce high enough levels of tannins suitable for skin dying compared to henna grown in places like Morocco and Iran. The use of henna dates back thousands of years throughout much of human history, and has been used for centuries, mostly by women, to celebrate life, love, marriage, fertility, and to protect against evil or harm. There is compelling evidence that suggests that henna was used for fertility celebration as early as 7000 BCE in Turkey. Through the ages, henna has spread extensively throughout the Middle East, Africa, India, parts of Asia, Indonesia, and Europe, and has been adapted into many cultures by people of different faiths including Muslims, Hindus, Jews, and Christians. The art of henna has finally made its way out West by people whose traditions originate from the Far East and is currently being explored by many Westerners who seek contemporary expression via ancient means. To convert plant to art medium, the dried leaves of henna must be crushed into a powder and finely sifted. Since henna works best in an acidic medium, ingredients such as lemon juice, black tea, and coffee are mixed with the henna powder to make a paste. The paste must sit overnight or long enough for the dye-release process to take place, whereby the henna’s staining capability is activated. The paste is then applied to the surface of the skin, and left on for a length of time. The longer the paste is left on the skin, the darker the stain will be and the longer it will last. When the dried paste is removed, it will appear to be a light orange color. Over the next 2 days, the dye will oxidize and the stain will become reddish-brown in color. 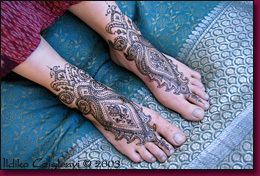 The stain can last anywhere from 1-2 weeks, sometimes more, depending on where on the body the design is, the quality of the henna used, and how well it is taken care of. The leaves of the henna plant have a tannic dye molecule, called lawsone, which when activated, penetrates thru the top layers of your dead skin cells (stratum corneum). The thicker the layers, the deeper the dye stains, giving you the darkest color to those parts, such as the palms of your hands. As time passes and your skin exfoliates, those layers slowly wear off, causing your design to fade. The palms of the hands and soles of the feet will stain the darkest and generally last longer than on other parts of the body. Tops of the hand and feet are also excellent places for dark, long lasting stains as well as thighs, lower legs and lower arms. Shoulder, bellies, backs, and chests give a moderate stain, but are still much better choices than faces and necks, which have very thin layers of dead skin cells and are not reliable places for long-lasting stains. The process of receiving henna is absolutely painless, and in no way harmful to the skin. In fact, henna is said to condition the skin, as well as beautify it. It also has antifungal and antiseptic qualities. You might feel a little cool as the wet paste is being applied to the surface of your skin. The ingredients I use in my paste are all natural; they include dried henna leaves, lemon juice, sugar, essential oils, and my own special tea blend. 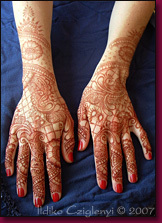 Henna always stains a reddish-brown color. 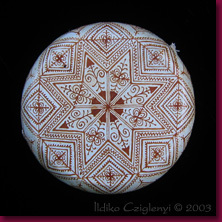 Color can vary from one person to the next, from a light brown to a rich burgundy, depending on which part of the body the design is on, how long the paste is left on, outside temperature and body temperature, and the quality of henna used. I never use products labeled “black henna,” and I would highly discourage anyone interested in using “black henna,” educating them about its harmful effects! because it is a dangerous chemical that can cause severe allergic reactions. *Note: Most of the photographs in the Gallery were taken with the henna paste still on the skin, which appears black because it dries to that color; the stain underneath is still a reddish-brown color. They are all created from natural henna!